In Volkswagen’s big press conference here at the Detroit Auto Show, Volkswagen AG CEO Herbert Diess revealed that Volkswagen will be building an all-new factory facility to produce electric vehicles alongside their existing factory in Chattanooga, Tennessee. 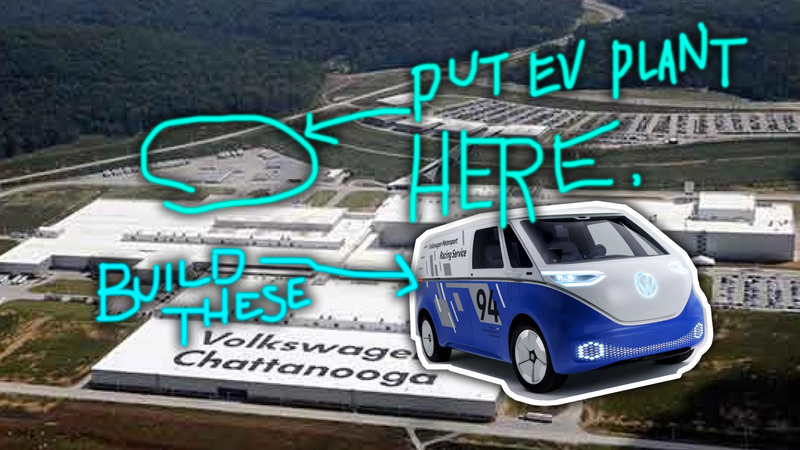 This factory will be the North American production site of such crucial vehicles as Volkswagen’s new-generation of mass-market electric cars like the ID Cross and, even more importantly, their promised new reborn electric Microbus, the ID Buzz. Volkswagen says the new factory will add 1,000 new jobs, and will be focused on building cars using VW’s new MEB modular electric car platform. Production is slated to being in 2022, alongside similar factories in traditional VW strongholds in Emden and Hanover, Germany, and after factories in China and Zwickau, Germany, which begin MEB production in 2020 and 2019 respectively. The press conference also described 2019 as being a year of “challenges,” citing economic and political instabilities. Oh boy. The Mayor of Chattanooga, Andy Berke, and the Governor of Tennessee (for the next few days before his term is out) Bill Haslam, were on stage for the announcement, and were, of course, quite pleased. Currently, VW’s Chattanooga factory employs 3,800 workers directly and produces the U.S.-market Passat and the Atlas SUV. This is a big deal for VW, and if everything goes to plan, they’re likely to surpass Tesla for the most electric cars built in America.